Jamie really works to improve nutrition in schools and teaches kids all over the world to cook simple, healthy meals. He’s so cool! And so is this contest! I hope you enjoy this video. We had fun making it, and you’ll see we tried a bunch of new ways to take the video. It was fun, and we learned a lot! This dish is special to me, as it was the reason I was able to meet my idol, Jamie Oliver. I entered his worldwide recipe video contest, and although I didn’t win, he was impressed and asked me to be part of his Food Tube Network, a group of amazing chefs who collaborate and share recipes on his YouTube channel. 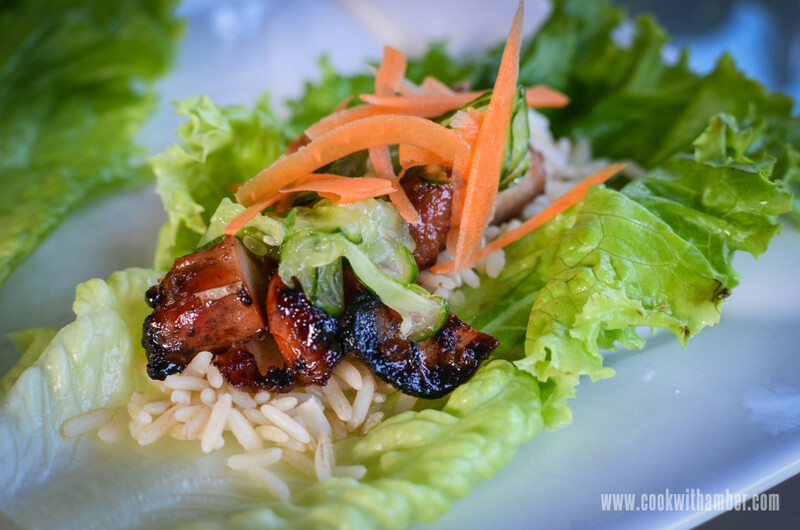 These lettuce wraps are fresh and filled with savory, tender chicken, sweet carrots, salty, crunchy cucumbers, and an earthy miso drizzle. If you want to take leftovers for lunch, keep them in the fridge overnight and add ice packs to your lunch bag in the morning to make sure everything stays fresh. Place the chicken in a large resealable plastic bag. Pour in the teriyaki sauce. Seal the bag, squeezing out as much air as possible. Give it a good shake to ensure that all the chicken is coated evenly. Transfer to the refrigerator and marinate for at least 4 hours or overnight. Preheat a grill to medium-high. Oil the grill grates. Remove the chicken from the bag and discard any extra marinade. Grill the chicken until lightly charred and cooked through, 4 to 5 minutes per side. Let the chicken rest for about 10 minutes, then slice the chicken. 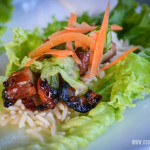 To assemble the wraps, stack 2 Bibb lettuce leaves together to make a cup. Fill with a few slices of chicken, several ribbons of carrot, and a few Quick Pickles. Spoon a little bit of the Miso Drizzle over the top. To take for lunch, pack all the ingredients separately and assemble right before eating. Place the cucumbers in a colander set over a large bowl. Sprinkle with the salt and toss to coat. Set aside for 30 minutes. Squeeze as much as the moisture out as you can with your hands. Combine the miso paste, lemon juice, soy sauce, and 2 tablespoons of water in a small bowl and stir until smooth. I LOVE your videos!! I am going to make this for my family, so I was just wondering what the measurements were for all of the ingredients. Is there a recipe on your website that I could print out?? Amber I love all of your videos and how you love to cook so healthy for your family. I was wondering if you could start making some new recipes and posting them on your page because I really do enjoy seeing and watching you videos. Hi Lily, thank you so much! Yes! And if you subscribe to my Youtube channel, you’ll be notified each time I upload a new video. Thanks again!